so many ponchos, so little time! | A knitting blog written by two hip chicks who live 3000 miles apart. so many ponchos, so little time! Okay, I had a dream last night and you were in it. We were at a huge yarn store, which was holding a class upstairs. (We were there early to buy yarn before class, obviously). So I bought some seriously UGLY yarn that was half solid white and half a really hideous yellow/orange color. It cost $6.25 for a skein (I remember this exactly), and I only needed one since I had MORE of this seriously ugly yarn at home. You, on the other hand, were buying shoes. (Why was a yarn store selling shoes?? I have no idea). They were Pumas, with a navy blue swooshy thing, but they were kind of like blinged out Pumas because they had rhinestones and stuff all over them. So I paid for my $6.25 yarn and then the lady rang up your shoes and they cost $1,400! And I was like “um Margaret, did you realize these are so expensive? !” and you were all “I know but they’re REALLY COOL! I must have them.” So I was kind of internally rolling my eyes, but I guess you can waste money if you want. THEN we went upstairs to the knitting class and there were a lot of empty seats so we were trying to figure out where the best place to sit was, but every time we went to sit down some middle-aged lady with a bad haircut would give us the stink-eye and we’d keep walking. And then I woke up, so I’m not sure how the class went. Isn’t that a kind of boring dream to have? I mean, why weren’t there any cute boys and couldn’t I at least have bought cashmere or something?? All this is to say WOW – has it been since January when we last posted??! That is bad, Margaret. We’ve got to step up our game. I guess you have an excuse since you’re planning a (hopefully) very frilly and pink wedding, but what am I doing? Working part-time and trying to keep the house clean. Big woo. I will do better! Maybe I will even post twice in a ROW. Crazytalk, but it’s possible. 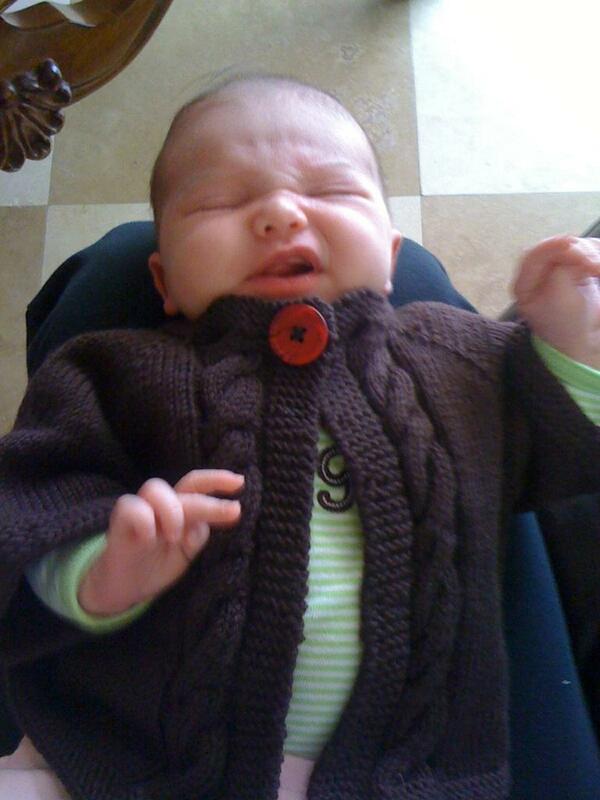 She doesn’t look too thrilled, but my cousin assures me that she was just a little fussy at the time. I made it with that Ella Rae Amity Solid we bought on one of our yarn crawls… I actually used stash yarn for something! Go me! 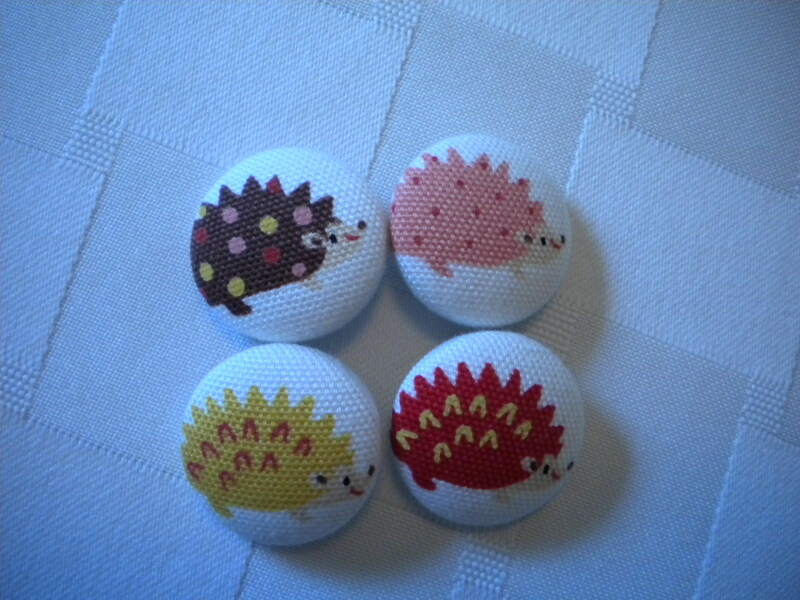 Really I just wanted an excuse to buy cute buttons from Etsy. And of course these socks (Child’s First Sock pattern by Nancy Bush), which took for-ev-er. (Have you seen The Sandlot? CLASSIC). And, OBVIOUSLY, I’m working furiously (albiet making very very slow progress) on my bridesmaid shawl! No pictures yet, I will have to post those next time. Phew. 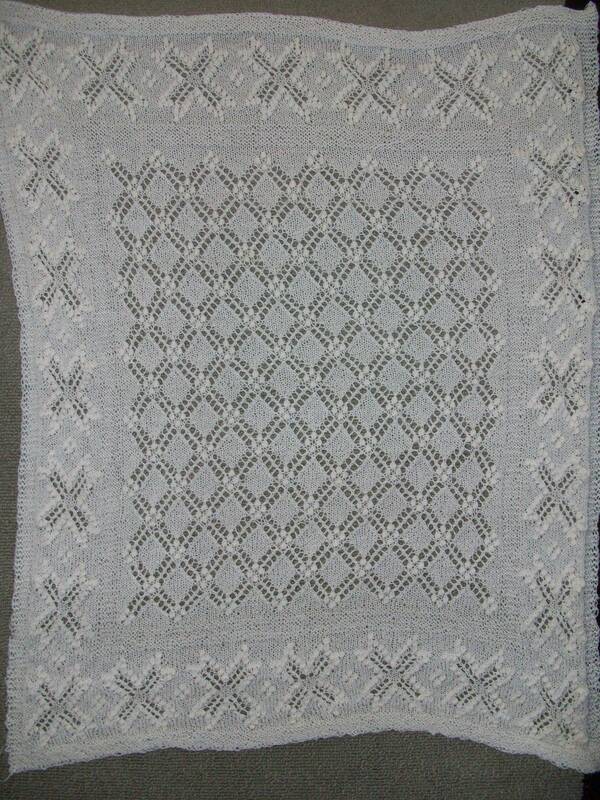 Now I need to get some new things on the needles… not sure what yet. Did you figure out which shrug to make? I think I like the Posh Wedding Shrug best, although if you’re making it with black yarn Veronique is probably better, since it’s so sheer. I know it’ll be Halloween-time, but a solid black shrug just doesn’t seem very wedding-y. Just my opinion. 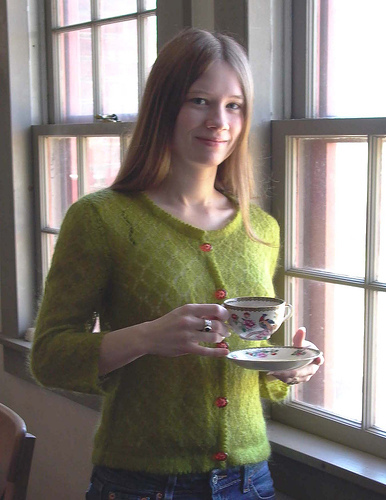 Of course, I wore a cardigan at my wedding (duh, I am a cardigan-aholic) and worked well too. You definitely don’t want to be fussing with it when you’re trying to hug everyone! That’s it for me (for now). I’m off to research yarn shops for your trip here in June – woo! PS: post an engagement photo! OMG, what the heck am I doing right now? What is this? Am I? Yes! I’m blogging!!!! And I have something very blogworthy to share: I finished the center panel of the Crown Prince Square Shawl also known as the Wedding Shawl! I don’t think I’ve mentioned on the blog that I’m getting married this October! And this means for the next 10 months I am almost completely devoting myself to wedding knitting . . . I have several projects in mind. I had previously cast on for it prior to getting engaged . . . anticipating that a proposal would be – HAD to be – coming soon. That proved to be bad knitting karma (or something) because I totally screwed up, dropped a few stitches, and didn’t have any life lines to fall back on. I ended up pulling out all my progress and setting it aside. In November, when we got home from Hawaii and were officially engaged, I began again. This time, I inserted life lines after every pattern repeat which helped me relax several times when I dropped a stitch or realized that I had done something wrong. 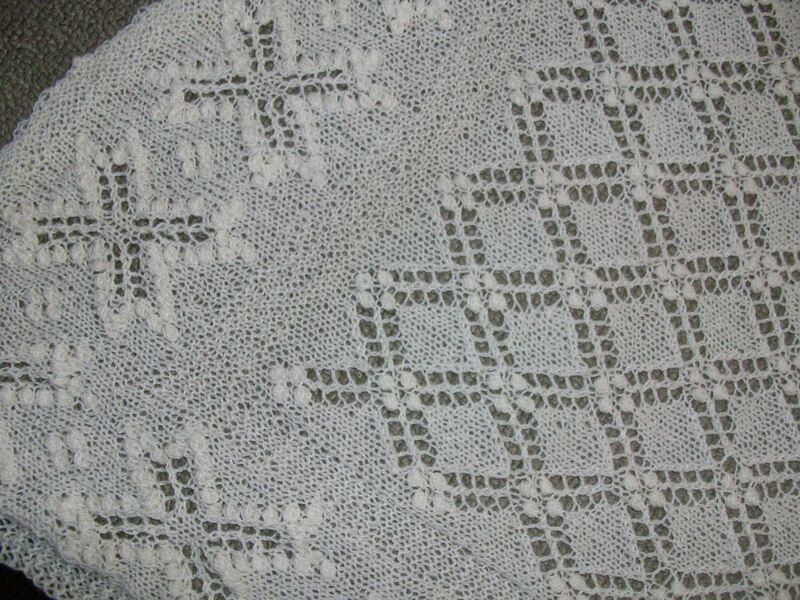 The knubs are 7 yarn overs in one stitch that you purl together on the backside row. I learned early on that the yarn overs should be wrapped very loosely around the needle and a very pointy needle (I used addi turbo lace needles which have a longer, more pointed tip than regular addi’s) is helpful to pick up and purl without missing a single yarn over. 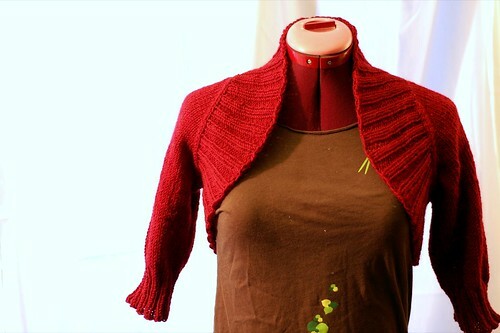 I mention this because you’ll be knitting lots of these knubs for the bridesmaid shawl! Thank you for that, by the way. Oh, and the yarn is back ordered so it’ll be about a month until it arrives in Virginia. Today, I picked up the book French Girl Knits because I’m drawn to the pattern Veronique . . . I bought four skeins of black shimmery yarn for it (with a gift certificate I got from Ron for Christmas so I don’t think I’m *technically* breaking my yarn diet) because I’m thinking it might be a cute wedding reception shrug. I know that I’ll want to take off the Wedding Shawl after the ceremony . . . it’ll be hard to dance and socialize in it and I don’t want to snag or get it covered in bloody mary (you never know!). Something with sleeves seems ideal for the reception, don’t you think? So, I have some mulling over to do . . . and I may not even decide until we go wedding dress shopping this May. Next up, I need to finish the edging of the Wedding Shawl (Can’t WAIT to cast on the 400-plus stitches not once but TWICE) and sew it on. . . I want to finish my Victoria Yoke Pull-over (a left over knit from 2009 I am *this close* to finishing – I just need to find buttons and crochet them on. I think this would be cute to wear in our engagement photos), and knit a pair of gloves and a hat for R (two items he’s requested for a while and he’s proven himself to be very knit worthy) . . . then it’s on to the two bridesmaid shawls for the non-knitters of the group, my reception shrug, and maybe something for Ron to wear in our engagement photos (like a chunky scarf or something). Yeah, that should keep my busy through October. . . So . . . what’s going on with you? Isn’t she beautiful? And it’s handmade in Portland, so I’m supporting the local economy. Yeah, that’s it. I emailed them first to ensure that they had corrected that little bag-handle-size-of-drop problem we encountered at Sock Summit, and it sounds as though they have. I’m hoping it’s sturdy enough to hold a lot of stuff. I mean, it’s made of FELT… so I don’t know. But that yellow Jitterbug (you know I’m a sucker for yellow yarn!) is be-a-utiful! It looks a lot like the Malabrigo sock yarn I bought on one of our many yarn crawls. But while you’re out gallivanting amongst the waves of Waikiki, I’m still here, hanging out. Knitting. And doing other stuff. As per usual. Ho hum. Not that I’m BITTER or anything. Of course, it’s getting down into the 30s at night, but still. NO BITTERNESS HERE. Nosireebob. I hope you bought me a present, is all I’m saying. My recent knitting progress has been fairly slow… although tomorrow is a holiday so I plan on knitting quite a lot. Yeah I know, I work from home… so what? A holiday is a holiday. I will be honoring our veterans with my mad knitting skillz. 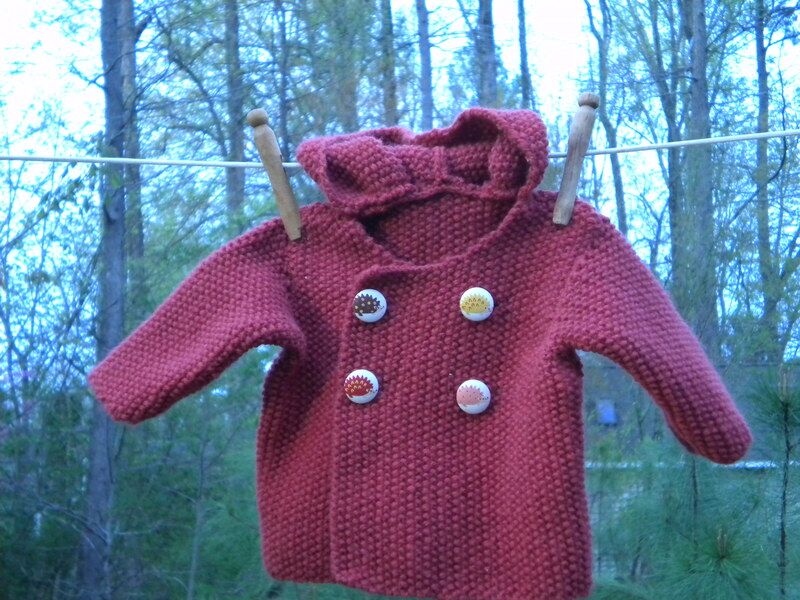 My latest venture has been this super cute baby cardigan for my cousin’s baby (due in February). I don’t know if it’s a boy or a girl, so I had to be careful in yarn selection – which is why I went with chocolate brown. If it’s good enough for Kelly Petkun, it’s good enough for me. I haven’t really FINISHED anything, except for this snazzy ballband dishcloth. Isn’t it pretty? Pink and green are my favorite colors, so it pretty much rocks my world. My MiL recently told me that her goal is to eventually have ONLY handmade dishcloths in their house. Isn’t that fantastic? Maybe I should try that. The only problem is that I tend to get kind of dishclothed out after doing a small one, and I’d need to make some big ones to use for drying hands and the like. But it’s a goal. Maybe. Oh, I’d also like to share that lately I’ve taken to writing out blog posts in longhand first. In pencil. On a sheet of notebook paper. Whilst flopped across the guest room bed. If I was listening to C&C Music Factory it would be 4th grade all over again over here. I fell off the wagon. I bought yarn. You know how I imposed the No New Yarn Until Maryland Sheep & Wool Fest Rule? I fully intended to knit from my very well-stocked yarn loft . . . and I still do . . . but I had a bit of a breakdown this past week. It all started very well-meaning enough. I was about to finish my Marlene’s and needed a new project. Ron asked for a new beanie and he since he wears his current Koolhaas hat just about every day, he is definitely beanie worthy. I wanted to knit a hat that would look like it came from one of the surf shops he typically goes shopping at – something on tiny needles with thin yarn. I decided on the Pismo Beach Hat (Rav Link) but also briefly considered doing something similar to the Waffle Hat (Rav Link) only with lighter weight yarn. So, $14 per skein is a deal (original price $21) . . . so I bought two. One just isn’t enough for a pair of socks for me but I actually don’t plan on turning these into socks. I envision this dreamy, smooshy, golden goodness to become a Multnomah, an herbivore, or an Aestlight. So, I broke down . . . I bought when I shouldn’t have, it’s a sickness this compulsion for on sale Jitterbug . . . but from here on out I’m going to stay strong! They are lovely though. 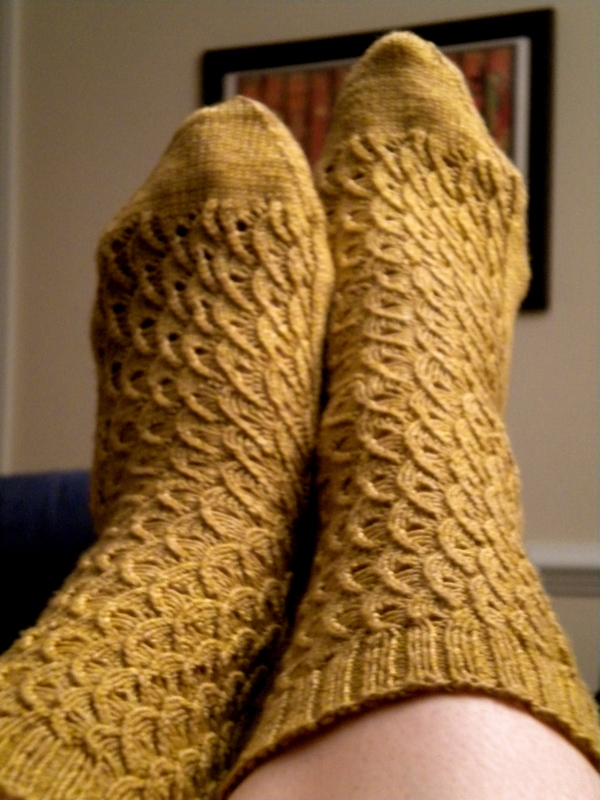 I’m wearing them now and I just adore the Cascade Heritage Sock Yarn. ADORE it. It reminds me of Lorna’s Lace . . . but cheaper. The stitches just pop and the color selection is tremendous. Plus, the price is more than decent at approx. $12/skein. Anna, you must try it. It is cold. Like, 57 degrees in the house cold. Like, I’m wearing a cowl and fingerless gloves right now cold. OMG. We ain’t in Southern California anymore, my friend. We are in a place with actual WEATHER. But I cannot complain because it’s my very favorite time of year (it just kind of snuck up on me, is all). Autumn, oh Autumn, how I love you. I love clomping through the leaves in the backyard on my way to hang up some laundry on the line (yeah, it’s 54 degrees, so what? it’ll dry eventually) and pumpkin-flavored things and having to wear a jacket when you leave the house. Hurrah for such a glorious season! I can’t believe that Sylus thing, M! I am CRAZY JEALOUS… why do I not have any sheep herding friends?? Man. I’m excited to see what you make. I need to make The Professor a cowl, so I need to look into yarn for that too. I’m glad to hear that the Cascade sock yarn is so good! I can’t remember how much it was, but I think Cascade goes on sale pretty often so now that I know I’ll be on the lookout. In other news I tried out a new yarn shop last weekend while we were visiting our nation’s capital. I’m pretty sure Obama flew over us in his helicopter while we were walking to the Jefferson Memorial and I’m pretty sure he waved at me. Pretty sure. I’d also like to point out that I walked three miles on Monday afternoon – this was after the million miles we’d walked that morning – to see Mr. Jefferson (looking good!) and go to Thai food. Why is everything so SPREAD OUT up there? Geez louise, it’s ridiculous. OH, and my knitting shoes (I’m pretty sure they must be knitting shoes since they were selling them at Sock Summit) broke while we were there. I’d like to take a moment to pay homage to my Cordovan Dansko Professional Cabrio Clogs. Sniff. Oh fabulous Danskos, you were with me in college as I slogged my way across WWU’s campus to make it to class and hustled to and from the bus stop. You were there whenever I went home to WA and needed good rain shoes and of course who can forget your fateful trip to Ireland, where you were indispensable in keeping my feet toasty and dry. You and I have clomped up and down the California coastline as well as along the Grand Canyon and New England. You were an honest pair of shoes, worth every penny, and lasted a good 8 years. I shall be replacing you as soon as I am able (albeit in a smaller size because you made me trip a lot… I blame you and not my innate clumsiness) but it won’t quite be the same. Since you BROKE IN HALF across the ball of the foot. Sad. Anyhoo, what the heck was I talking about? Oh yeah. DC. Right. Well we did stop in at Stitch DC, a lovely little shop in a nice neighborhood. I didn’t actually buy anything, which is totally depressing, but I’m trying to be strong! I mean, we have Maryland Sheep & Wool in May, so I have to save my pennies. They did have some locally spun/dyed yarn, which is awesome, but it was kind of rough and I am such a wimp that it wasn’t soft enough for me! It WAS a nice place though, so next time you’re in the District of Columbia you should check it out! (No man cave this time though, just warning you). In retrospect, I should have taken more handknits with us, but we didn’t expect it to be so cold! We had a great time though – we will definitely be back. So many museums! So many monuments about things of which we know nothing! It would take forever to see it all. Hope you’re enjoying your beachy weather. I have to go make some more tea. How exciting! Our new revitalized blog is BACK. But, don’t call it a comeback. We’ve been for years! Rockin’ our peers and putting knittas in fear . . .
Oh. Got a little carried away with the Ladies Love Cool J lyrics. Where is that guy these days anyway? So, I received the most thoughtful unexpected gift ever last week. A friend of R’s is pretty fascinated that I knit – but in a good way. You can tell when some one is incredulous and thinks your pretty much the queen of dorks when you tell them that you knit and when some one is truly interested and curious about why you do it and how it really only takes two sticks and a piece of string to make something useful and beautiful. As it turns out, he HAPPENED to know someone who raises and cares for sheep (like an aunt by marriage or something) and said he was going to ask for some yarn and have it sent to me. That was awhile go and I totally forgot. You know, it’s the thought that counts and whatever. . . The Boyfriend has requested a pair of fingerless gloves out of it. And I think I’d have enough for a hat and maybe even a beret or hat for me. We’ll see . . . because first I need to finish my Marlene socks (Rav Link). They are a little slow going because of all the twisted stitches. I’ve also had to tink back several times from screwing up the pattern. The pattern itself isn’t difficult. In fact, I pretty much memorized after completing the second repeat. I’m using Cascade Sock Yarn (Rav Link) which I am seriously impressed with. The color is beautiful and the yarn feels resilient. I bought it for about $12 while in your home town (or, just outside of your hometown – at the shop with the awesome sign of the sheep wearing a top hat) and the yardage is seriously good. I would totally buy this stuff again. By the way, your review of DB Magazine was pretty righteous (I’m listening to 80s music so that word just needed to be used). I am surprised by how much I like the sweater coat on the cover. But alas, I am on a major yarn diet until spring of 2010 . . . I am determined to make it to the Maryland Seep and Wool Fest next year! So yeah. Guess it’s been awhile… went to Europe, got The Professor all “official” with his PhD and moved 3000 miles to the Historic Triangle on the peninsula of Virginia. I officially live in a commonwealth. (Contrary to popular belief we do not all wear colonial garb, though I WISH it were required. It would make going to the gym much more interesting). At least we have knitting weather around here, and I plan on putting all my wool to good use. Speaking of which, I just finished my first (adult-sized) sweater in a wonderfully soft cotton/silk blend (yeah yeah, it’s not wool, but go with it). It’s a butter yellow color so it goes with a lot of the neutrals in my wardrobe. That seed stitch is a KILLER though. Margaret, why didn’t you warn me about this?! It took me a year to finish just because of all that freaking SEED STITCH. It looks really cool though, so I guess I can’t complain too much. Just have to note that this photo was taken in our backyard which IS AWESOME. The cotton was kind of hard on the ol’ hands too. 😦 Whine, whine, whine… I am an expert. I still have juuust under 3 skeins left so if anyone wants to purchase them for a nominal fee, please let me know! We were in Arizona last week with my in-laws and ended up (it was my MiL’s fault, I PROMISE) at Knit Happens, where I planned to buy nothing so of course walked out with size 0 Lantern Moon sock stix, 3 balls of Debbie Bliss Rialto in a beautiful deep chocolate brown (50% off! come on now) and the Fall/Winter 2009 edition of Debbie Bliss magazine. It’s my first DB Mag experience and I love a few of the sweaters (duh, that’s why I plunked down my eight bucks), plus there’s an “At Home: British Style” section which is perfect for an Anglophile like me. However. Wow. Having a whole magazine about yourself is kind of weird. But hey, it works for Oprah. Can you imagine if the Yarn Harlot had a magazine? There could be regular columns entitled “Another Reason I Love Canada” and a fashion corner with the latest clothes she borrowed from her daughters and/or found on the floor of the closet. It starts out with a letter from DB herself (! ), blah, blah. This is followed by a section entitled “The Blissful Life,” where Deb shares what are purported to be her personal collections of items around her home, such as antique fabric and – whoops! – her new yarn line! Now how’d THAT get on the coffee table?! Also photos of a “small but delightful” haberdashery (what the?) in Paris. But of course. I realize that I have been known to travel to Europe and mostly love antique linens and all, but sheesh. Maybe this a fantasy sort of magazine? I mean, I guess normal things, like throw pillows you bought at Target are kind of boring. I just hope she doesn’t think regular people actually live like this. Then we have “My Knitting Friends.” Yes Debster, you’re famous, that’s awesome… but are these people really your FRIENDS? Like, do you meet for coffee? I question this. The article is good though, and long, so it’s not just a one page summary or anything. It’s also a person I’d never heard of so that was interesting. But now, NOW is where the oddest part comes in… the “Ask Rosy” section where you can ask all your burning knitting questions. This makes sense, although answering technical questions is kind of boring to read. I should propose a question column to IK that will have things like “I love my boyfriend but he’s allergic to wool and I want to have my own sheep farm, WHAT DO I DO? !” That would be way more fun. And interesting. So anyway, the point of DB’s column is to answer specific technique questions about HER OWN PATTERNS. Snoozefest, seriously. The hilarious part is that it makes DB patterns seem like they’re so poorly written that they need an entire magazine page to answer questions about them! I mean, I guess it could just be a lot of knitters who don’t understand pattern terminology and haven’t mastered the art of Google… but still. It makes me nervous about trying one of the patterns. and cutesy animal scarves for the kids. Some super chunky knits too, which I have lately become a fan of. If only I could get The Professor into wearing cardigans. It makes sense, right? Cardigan + elbow patches x pipe = professor. So yeah. Then some baby jazz, which was prettily photographed but doesn’t really grab me. A baby blanket in 27 balls of Cashmerino Aran? (For those who don’t know, each ball costs between $8-10!) I don’t think so, lady. Then we end up with a fisherman’s gansey that looks nothing like one… probably “inspired by” I guess. And the duder they have modeling it look like a girl. Is it just me? Except for the little beard. So you know. So in sum, the patterns are awesome (some Ravelers complained about a lack of multiple photos of each project, but I didn’t think it was too bad) and it’s a little heavy on the self-awesomeness. But the magazine is CALLED Debbie Bliss Knitting Magazine so she’s allowed. I certainly would! Well maybe I would… I don’t know, a magazine AND a yarn line sounds like too much work. But I’d definitely include that Knitter Personal Problems column too – that would be awesome! debtog on New Blog (kind of)! so many ponchos, so little time! · A knitting blog written by two hip chicks who live 3000 miles apart.